One night in Cabo San Lucas we had a taste for some authentic Mexican cuisine so we gave Mi Casa restaurant a try out. As with any other night eating out in Cabo we was not let down. Not only is the food traditional, the restaurant, and the decor are very traditional as well. You get a feel for old Mexico in here, and it's a good feeling. After being seated, and taking in the murals along the walls we ordered a bottle of wine then looked at the menus. Our starters that we ordered were las quesadillas del comal con hongos, chorizo y rajas. It was one of those menu items that you just point too rather than get your mouth around to saying it. It was a tortilla with melted cheese with a choice of mushrooms, sausage or chile poblano strips. We went for the mushrooms, and they had plenty of flavor. We also went for the campechano. This was cooked shrimp in a panga sauce of avocado, lime and celery. This was then topped with cilantro and onions. This went well with the tortilla that we ordered. When we order anything we always both have a piece of each rather than just eat our own order. For our main course at Mi Casa restaurant we went for a taste of Mexico with El Chile en Nogada. This is a dish that celebrates independence day. It was poblano pepper stuffed with sauteed meats, served with a fresh walnut cream sauce. 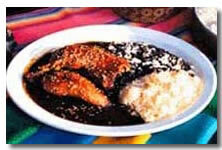 And our other choice was los tamales bandera. This was steamed tamales that were in the colors of the Mexican flag. Red was filled with chicken in mole, green was shredded pork with tomatillo sauce and white was cheese & poblano strips. It made a change for us two have to dishes like this as we usually go for the seafood. This made a welcome change, and we wasn't disappointed with our choices. We managed to leave enough room for our desert which turned out a blessing as they had a coffee ice cream cake called El pay helado de chocolate o al café. And we also went for the La cocada con almendras, which was a coconut and almond soufflé. This gave our meal out at the Mi Casa restaurant a perfect ending. 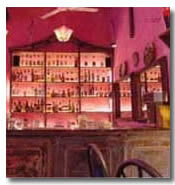 The food, and the service were both excellent at the Mi Casa restaurant in Cabo San Lucas. 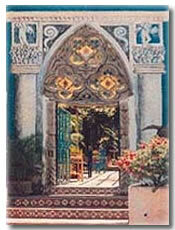 Mi Casa is located in the Town Square in Cabo San Lucas, Baja California Sur, México.